Discussion in 'Sesame Street' started by muppet maniac, Feb 11, 2005. New York, February 10, 2005 - For 36 years, Sesame Street has sought to meet the critical needs of children while preparing them for school and for life. This season premieres April 4 on PBS KIDS (check local listings). In addition to literacy, numeracy, and science, Sesame Street, the world's largest informal educator of children, will tackle an issue facing many families today: children's health. The new season features a new curriculum designed to address the importance of establishing an early foundation of healthy habits. Sesame Street's newest curriculum is part of a larger Sesame Workshop company-wide initiative, "Healthy Habits for Life," created in response to the growing crisis of childhood obesity among children. The preschool years are a crucial time in children's lives to foster healthy habits. Recent data reflect both the immediate and long-term consequences of poor dietary behaviors. Tackling the critical issues of health and well being, Sesame Workshop continues to set the benchmark in educational television with Sesame Street storylines that guide preschoolers and their caregivers through lessons related to healthy eating, the importance of active play and other key activities such as hygiene and rest. "It was particularly important for us when dealing with a topic such as health to choose child relevant issues such as trying new healthy foods, and simple exercises and make them exciting and attractive," said Dr. Lewis Bernstein, Executive Producer of Sesame Street. 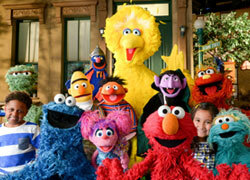 "As always with Sesame Street, the shows are written with humor and messages to entertain both children and adults. In this fit and fun season, we also give parents and caregivers the tools to help them extend these health messages into their homes and daily routines." "There¡¦s a real need to educate young people, and their caregivers, about healthy lifestyles," adds Rosemarie Truglio, PhD, Vice President Education and Research, Sesame Workshop. "Our goal is to lay a strong foundation for healthy habits in order to put children on a positive trajectory for a healthy life, so that healthy living becomes a normal, everyday experience. Who better to guide preschoolers towards a healthier life than Elmo, Oscar, Big Bird and the rest of the gang on Sesame Street?" *and Buzz Aldrin shares the importance of food for energy to Telly. Along with the “Healthy Moments,” the new season will feature all-new Muppet “street” scenes, new animations and original live-action films that all tout activities and behaviors that are good for you. Storylines include: “The Healthy Foods Name Game,” hosted by Mr. Healthy Foods, Elmo must find four healthy foods of various colors on Sesame Street before the mouse can climb to the top of the refrigerator; and “American Fruit Stand,” Sesame’s take on the 50s variety series that features a singing Miles rhapsodizing about the nutritional benefits of fruits and vegetables. Other segments include a song entitled, “A Cookie is a Sometimes Food,” where Hoots the Owl explains that there are anytime foods and sometimes foods: cookies are foods that you can eat sometimes, but fruits are delicious and healthy anytime! Additionally, every other show will feature a “Health Module;” a cluster of four segments related to health, exercise and nutrition. New animations that address the healthy habits curriculum include: “Colorful Carrots,” a song about the different ways you can eat them and how they are good for the body; and “TJ: Fruit Snack Samba,” featuring TJ with his dog Bernie, who sing about choosing fruits as a healthy “anytime” snack. Original live-action films that depict the healthy habits curriculum include “Make Your Own Sundae Sunday,” featuring two boys who make a low-fat sundae topped with lots of healthy fruit! In addition to the core curriculum, Sesame Street continues to introduce preschoolers to other cultures with all-new “Global Grover” segments. This season, Grover travels to Bangladesh where he learns about fishing and toy making; to England to find out about a new sport called cricket; Paris, where he shops in a French market for healthy items; and to the Netherlands, where Grover discovers that lots of people ride their bikes to get around the city. 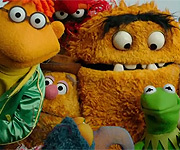 New parodies, that take their cue from the world of pop culture, include: “Desperate Houseplants;” “Grouch Eye for the Nice Guy;” “Chasing the Cheese,” with a new Muppet created in the likeness of sportscaster Chris Berman; “24,” based on the TV series of the same name; “Cookie Monster: Food Investigator,” a parody of Dragnet; and the series introduces Donald Grump, a Muppet who looks suspiciously like one of America’s real estate moguls. Season 36 will also feature five new “Elmo’s World” segments where Elmo will be thinking about Jumping, Cameras, Skin, School and Cats. Additionally, there will be a “Spanish Moment of the Day,” an expansion of the “Spanish Word of the Day” that will focus on Latino culture. Season 36 of Sesame Street is funded in part by a Ready To Learn, No Child Left Behind grant from the U.S. Department of Education through the Public Broadcasting Service and the Corporation for Public Broadcasting, Public Television Viewers and PBS. Sesame Street is underwritten in part by Beaches Family Resorts and McDonald’s Corporation. Information and images for Sesame Street’s 36th season can be found at www.sesameworkshop.org/presskit. Sesame Workshop announced the multi-year, company-wide initiative, “Healthy Habits for Life,” in May 2004 on Capitol Hill with the support of Senate Majority Leader Bill Frist and Senator Wyden. Featuring a coalition of partners and an advisory board of health, nutrition, fitness and education experts, the program was created to develop and distribute multi-media, age-appropriate content targeted to preschoolers and their caregivers; empowering them with knowledge and positive attitudes about healthy habits. Sesame Workshop is a nonprofit educational organization making a meaningful difference in children's lives around the world. Founded in 1968, the Workshop changed television forever with the legendary Sesame Street. Today, the Workshop continues to innovate on behalf of children in 120 countries, using its proprietary research methodology to ensure its programs and products are engaging and enriching.Sesame Workshop is behind award-winning programs like Dragon Tales and Sagwa, The Chinese Siamese Cat and ground breaking multimedia productions in South Africa, Egypt and Russia. As a nonprofit, Sesame Workshop puts the proceeds it receives from sales of Sesame Street,Dragon Tales and Sagwa products right back into its educational projects for children around the world. Find the Workshop online at www.sesameworkshop.org. PBS KIDS® is committed to providing the highest quality commercial-free content and learning environment for children across the country. Providing age-appropriate, diverse programming for kids, PBS KIDS’ programs consistently earn more prestigious awards than any other broadcast or cable network. Only PBS KIDS has earned the unanimous endorsement of parents, children, industry leaders and teachers. With additional PBS resources to complement its programming, including PBS KIDS online (www.pbskids.org), PBS Parents(www.pbsparents.org), PBS TeacherSource, PBS Ready To Learn services and literacy events across the country, PBS KIDS is providing the tools necessary for positive child development. PBS is a nonprofit media enterprise owned and operated by the nation’s 349 public television stations, serving nearly 90 million people each week and reaching 99% of American homes. Will it also air on PBS the same date or what? The "Chasing the Cheese" segment. Obviously, they might make the spoof character named "Chris Vermin" and have him be a mouse or rat chasing the cheese. The one thing I hope they preserve is part of Chris Berman's natural talent for making up nicknames of all the famous athletes, and the not-so-famous too. 24, does this mean they'll finally break the 21 Number of the Day barrier? Guess we'll have to wait another month and a half more to find out. Where did you hear about number 24? Here's the quote, stright from the news article ssetta. a parody of Dragnet; and the series introduces Donald Grump, a Muppet who looks suspiciously like one of America’s real estate moguls. I know the fact that Hoots the Owl is making a comeback in this season, and I am glad to see his return, he is such a cool character. I know--it's not like McD's runs "commercials" before or after SS, but come on. I would like to see Sesame Workshop's response to this. Actually, I'd like to see SW *drop* McDonald's like a bad habit (i.e., eating at McDonald's). SW could really help the healthy children effort by publicly just saying "no" to the enemy. Another question is what other "healthier" or even health-neutral organization could take the place of McDonald's sponsorship if they did drop out? This new song "A Cookie is a Sometimes Food" is going to have a hard time competing with "C is for Cookie". Are we going to have to see a sketch with someone trying to break cookie monster of his bad eating habbits? Is someone going to intervene with a "Colorful Carrot"? Goodness i hope not, i like cookie monster just the way he is. I agree, but it wouldn't hurt to play his "Healthy Food" rap every now and then. I think that song is in the new DVD Healthy Monsters. I think I have it and remember it somewhere in there. But I agree I love Cookie just the what he has been. He know that cookies aren't good to eat all the time. He eats them because thats where he got his name. They could also air the old sketch where María tries to get Cookie Monster to eat new foods like apples, raisins, and even carrots. And the funny part of the sketch is that after he eats the food, he ends up eating the plates too. >>I know--it's not like McD's runs "commercials" before or after SS, but come on. I would like to see Sesame Workshop's response to this. Actually, I'd like to see SW *drop* McDonald's like a bad habit (i.e., eating at McDonald's). "Brought to you by Rhoads 60 second cinnamon rolls. How many seconds are in a minute? 60! It only takes a minute to wake up your mind with PBS Kids"
Anyway, this parody stuff keeps getting funnier. A while back the parody element was missing from the show, and this season we've seen Parodies of Spongebob, Joe Millionaire, Dr. Phil and the Tonight show with Jay Leno. Though Millionaire and Phil will be the most dated of the bunch, and shortly too, they were funny. I know people have problems with the dated refferences, but then again, they made fun of Disco in the 70's and Miami Vice in the 80's. Desperate Houseplants and Grouch eye have the potential to be the funniest segments this season. Maybe they should have a segment on the count encouraging kids to dance, he seems to like dancing quite a bit. I thought of another thing they could do, is have a muppet on sesame street who is fat, everyone else encouraging him to exercise and him loosing weight and feeling happy. The new season starts monday..... in a few days we'll see how these changes will affect the program. Hopefully it'll be smooth like Global Grover, and not as shakey as the original "format change" line-up! Well... Haven't posted it till now, but I saw a promotional ad on Saturday on the Kids WB lineup of shows that could be thought of as a smaller-scaled sneak peak at the new season. At least, it was a promotional segment promoting the issue of health which'll be their big focus this season. The segment had Luis introducing Elmo to healthy foods, he probably had some fruits and veggies on plates before him. And then, in true Muppet comical fashion, Elmo wanted to introduce Luis to some healthy food... Namely, Mr. Broccoli, and then a male broccoli Muppet voiced by Joey Mazzarino pops out to greet Luis. That's been around for a few months, Count. I have seen it locally during the new Ninja Turtles show a few times. I think there's another one where Luis and Elmo are doing various dances to excersize... I forget the ad, otherwise I'd give you a little more detail. "Desperate House Plants"... now that sounds funny.